IBPS Clerk Exam Analysis 2018-19: Institute of Banking Personnel Selection or IBPS has already conducted the IBPS Clerk Main Exam on 20th January 2019. IBPS Clerk main exam is the final stage of the selection process for the post of Bank Clerk as there is no interview for this post. Candidates will be shortlisted based on the merit. The IBPS Clerk Main exam had many surprises this time. The overall exam was of moderate level. Among all the sections English was the tricky one and General awareness was the easiest one. We bring you IBPS Clerk Exam Analysis to assist you in understanding the score you are going to obtain in the exam. For the candidates who have appeared for the mains exam for the first time the paper was Moderate – Difficult. However, for the repeaters, the IBPS Main exam would seem like an easy to moderate paper. It was observed that this time English paper was the tricky one and the general awareness section was the scoring one. Break up of Topics: Data Interpretation – 20, Quadratic Equation – 5, Data Sufficiency – 5, Quantity1, Quantity 2 – 5, Miscellaneous – 15. Break up of Topics: reading and Comprehension – 15, Word Replacement – 5, Word Usage – 5, Sentence Connectors – 5, Double Filler – 5, Sentence Arrangement – 5. Break up of Topics: Seating Arrangement and Puzzles – 25, Direction Sense – 4, Alphabet – 2, Inequality – 3, Logical Reasoning – 6, Machine Input Output – 4, Coding-Decoding – 3, Syllogism – 3. In this section, the questions were from easy to moderate. Most of the questions were asked from the current affairs when compared to static GK section. The current affairs were mostly from July 2018 to January 2019. IBPS Clerk exam for mains will be conducted in January 2019. The exam will take place after the Prelims get over on 16th December 2018. Candidates who qualify the prelims will be taken forward for the mains exam. Mains exam will be held in a single day and in a single shift. Let us provide you with IBPS Clerk exam analysis for mains 2017 so as to give you an idea on the difficulty level of last year so that you can prepare accordingly. Banking Awareness and Current Affairs of last 5-6 months were asked. Static general knowledge questions were also asked. The biggest lessons that IBPS Clerk exam analysis teaches the applicants is that the exam is highly unpredictable and uncertain. Any topic or section can undergo a change in the exam pattern. Questions that you think will not come for the exam will pop up and in a very uncertain way. So, applicants appearing for the exam this year are advised to prepare really well for the exam without indulging into a selective study. Also, do not take the paper for granted, it can cost you a price not thought of. Q1. What is the basis of Embibe’s IBPS Clerk exam analysis 2018? A1. 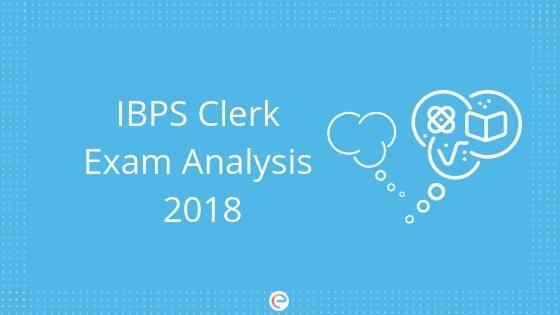 Embibe’s IBPS Clerk exam analysis 2018 is the first hand input provided by applicants, across centres who appeared for the exam. Q2.Does IBPS Clerk Exam Analysis help future aspirants? A2. Yes. The IBPS Clerk exam analysis surely assists applicants. It discloses the exact nature of the questions being asked in the exam. Q3.Will the cut off of IBPS Clerk be less this year? This will depend upon the difficulty level of IBPS Clerk examination. Now that you have a detailed article on IBPS Clerk exam analysis, we hope you do not face any difficulty to analyze the exam. Going through the analysis will assist you to understand the IBPS Clerk exam in a better way. If you face any issue regarding IBPS Clerk Exam Analysis, do drop us your query in the comments section below and we will get back to you right away.